A tender moment in a trash bin went all wrong for a couple who found themselves being held up at pocket knifepoint. Police said two 44-year-olds had climbed into a dumpster to be alone just after 6 p.m. Saturday when two men interrupted them and demanded their belongings. Officers said the man and woman were engaged in "an intimate moment" when they were robbed of their shoes, jewelry and the man's wallet. 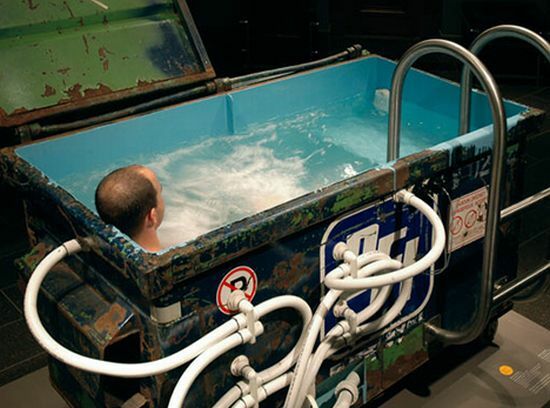 I do not know which is weirder.. this article or the guy in the photo bathing in a dumpster hot tub. Color me grossed out. Darn the article was removed! I hope Rygel is right....that it was clean inside. That is just gross to me. I've had intimate moments in some very bizarre places but never anywhere with lots of germs and trash. Sorry that was probably TMI. Do You Take Coffee Breaks? Blogging: Good for Your Mental Health? Why Do Folks Embrace Conspiracy Theories?